You borrow a dollar bill from a spectator and place it on a table. You then back away from the table approximately 10 feet. Suddenly, and using the powers of your mind, the dollar bill clearly begins to levitate upward, becomes momentarily suspended above the table, then gently glides back down to the table surface. You immediately take the dollar bill from the table and hand it to the spectator for a complete inspection. 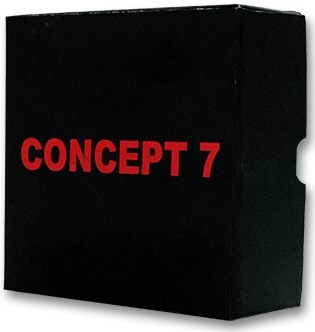 Concept 7 is a brand new concept in pre-set web levitations. Concept 7 can easily be made portable and sets up in only a few minutes. Concept 7 allows you the opportunity to completely walk around a performance table and also gives you the option of either levitating the object directly at the table or from up to 20 feet way. Whatever way you choose to perform Concept 7, you will "fry" your spectators! You can even instruct the spectator to place the dollar bill directly on the table themselves, showing that you never touched the dollar bill. Concept 7 comes with fully Illustrated Instructions, Instructional DVD, and everything you need to immediately begin your pre-set web levitations. Concept 7 also includes a clever Bonus Routine that can open doors to other possible effects using the methods of Concept 7. A really smart idea! Pretty practical! I'm having fun playing with it!